Photos by Scott Shook | JRobert in his state-of-the-art home studio. Marco Island’s reigning Artist of the Year, JRobert Houghtaling, is excited for the debut of the PBS documentary, “The Great Florida Cattle Drive: Unbroken Circles.” Houghtaling composed the score for the hour-long special—an honor the venerable musician considers the highlight of his outstanding musical career. Houghtaling is a fourth generation Floridian who grew up in the cattle country of Ruskin. The documentary makes its Florida debut February 19 on WEDU (Tampa). Southwest Floridians can see the documentary for the first time on February 20 at 11 PM. The documentary will be presented nationally this June. Houghtaling flew to Tallahassee on February 16 for the red carpet premier of the documentary. One of the highlights of the PBS project was working with Grammy award winning artist John McEuen of The Nitty Gritty Dirt Band in Houghtaling’s home studio, where the entire music score was produced. Houghtaling was also happy to have his talented son Martin appear in the music score. 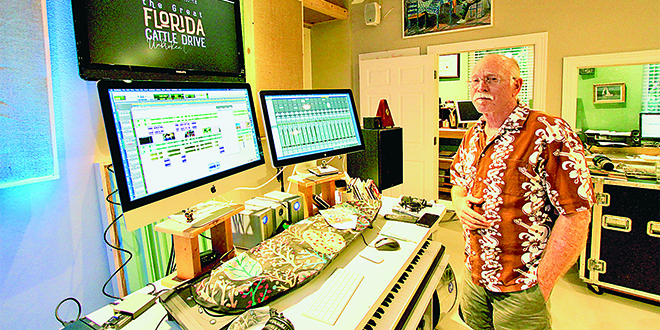 The opportunity came along at the right time for Houghtaling, who has been in the music business for over 50 years—the past 30 of those on Marco Island. He’s glad it didn’t happen earlier in his career. The documentary, produced and directed by Elam Stoltzfus, tells the story of the Great Florida Cattle Drive 2016, the history of Florida’s heritage cattle breed, how they almost went extinct and what folks are doing to preserve Florida’s cow culture for future generations. Houghtaling was charged with developing the music that would carry the documentary along.